I have been with my wife and daughter in Kuwait for the past 3 years. I would like to bring my son who is in India on visit visa. 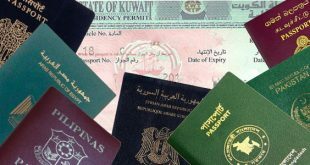 Can I change his visa to family visa after he enters Kuwait? My son age: 2 years one month by the time he reaches Kuwait. My salary: KD 800. Answer: Under current rules and regulations, infants two years and below can have their visit visas changed to family visas when they enter Kuwait. But as you stated, your son will be two years one month when he enters Kuwait. This means that your son will be outside the permissible age group that qualifies for a change of visit visa to family visa. But the big question is why apply for a visit visa when the KD 800 monthly salary you earn more than qualifies you to sponsor your son on a family visa. So, please, go ahead and apply for a family visa for your son, you are qualified for it.